The Law Department organised a team of students, staff, alumni and supporters who walked to raise funds for our own LSBU Legal Advice Clinic. 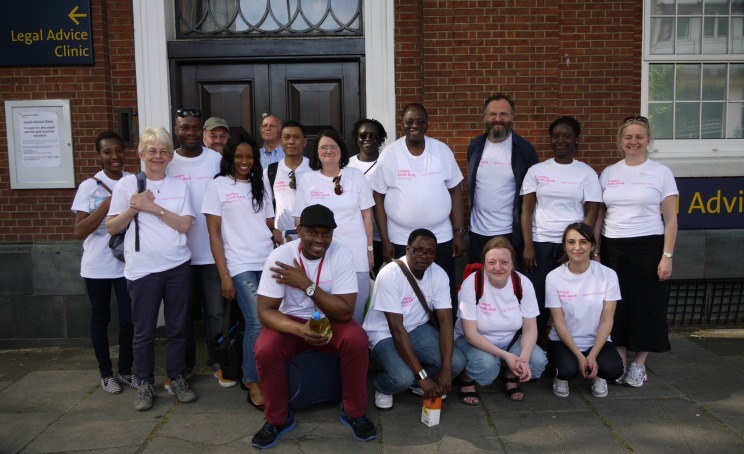 The walk was organised by the London Legal Support Trust, an independent charity which raises funds for free legal advice services in London and the South East. This year's walk is likely to beat previous records, with an increase in participants (more than 500 teams; nearly 10,000 walkers) and more money raised than ever before - over half a million pounds at present. The LSBU team was joined by lawyers, advice workers, supporters and senior figures in the legal profession, including the Lord Chief Justice, the Master of the Rolls, the President of the Supreme Court, the Attorney General, the Director of Public Prosecutions, and the President of the Law Society. Alan Russell, Director of the Legal Advice Clinic said: 'It was a great evening; the weather was just perfect and we thoroughly enjoyed our stroll along the river through to Hyde Park, a big thank you to all our walkers and everyone who sponsored us." "The walk could not have come at a better time for cash-strapped legal advice agencies and their clients. Funding cuts to legal aid mean that since 2013 there's been no publicly funded debt, employment, welfare benefits and education advice at all. "Housing family and immigration advice is now restricted to all but a handful of cases and that's precisely the type of work we do in the Clinic." The LAC, which has helped more than 1000 clients since opening in September 2011, provides a free face-to-face community legal advice service, staffed by trained law students and supervised by experienced, practising social welfare law solicitors.